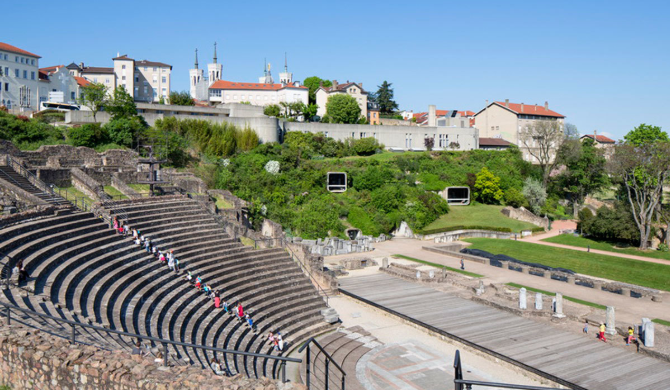 The archaeology museum of Lyon, recently renamed to Lugdunum – Musée et théâtres romains, is located on the hill of Fourvière, overlooking the ancient theatres of the Roman city of Lugdunum. This museum is home to an impressive collection of artefacts from the city of Lyon and the surrounding region. The museum’s collection can be divided into two parts. The first, known as the fonds ancien, comprises thousands of inscriptions, statues, and other ancient works of art collected over the centuries by Lyon’s Musée des Beaux-Arts and gifted to the archaeology museum at its opening in 1975. The second part is the ever-increasing collection of archaeological artefacts uncovered by excavation and deposited in the museum repository, as is required by French law. The fact that many of the museum’s objects have been in collections for centuries coupled with the growing number of artefacts from new excavations makes for a difficult collection to manage. This past fall, I had the opportunity to work with the museum’s collection, both assisting with an inventory of all artefacts on display and helping with the move of the museum’s storage to an off-site facility. During my time at the museum, I encountered issues concerning the accessibility and documentation of this very large and old collection. In addition to discussing these issues, this talk will provide a brief introduction to Lugdunum – Musée et théâtres romains and give an overview of my internship there. It will also present examples of how the museum is making its collection more accessible to scholars despite recently moving the majority of its storage to a decentralized location. These initiatives include the creation of an online database and the use of new gallery spaces outside the museum.